Views from the loch. : Thats fishing! Any seasoned Pike fisherman has on occasion uttered words mostly unprintable when the going gets tough! This of course excludes the “plastic” Pike lads who fish in a goldfish bowl stocked with soft flabby sandbag Pike taken from other waters and artificially stocked! So what is the solution to this ever present problem, well the answers are many and varied as you would expect, after all it there was a simple answer we would all be doing it all the time! My top three strategies involve depth, bait and flavours. With regard to depth I like to be familiar with the bathymetries of the loch where it is possible to get an understanding of the submerged contours. 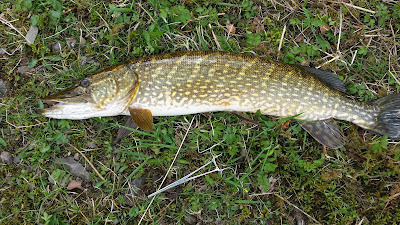 Of the hundreds of Pike I have been fortunate to catch on the loch most were caught in the 5 -15 ft depth range I’ve had a few at 50 -60 ft but nothing deeper. So fishing in 120ft of water may not be the best method of fishing for Pike! With regard to time you really do want to be fishing from around 03.30hrs at this time of year and try and get the hours of dusk into the equation. A technique shown to me by one of our members Scotty involves using a popped up bait Pollan is a good one but whole Mackerel (not the soft Baitbox stuff but fresh supermarket specimens which are better in every way). Simply choose your bait and attach a heavy 4oz lead running ledger style and cast out. If nothing is doing gently start pulling on your bait pulling it through the lead making the popped up bait drop down then allow it to slowly rise and so on. This method has often stimulated a take where static baits have failed so give it a try. Next I focus on baits as I have said above fresh supermarket baits trump the pre packed soft baits by a country mile. Mackerel is my most successful bait ever no question and with the fresh stuff, smell and oil is present in abundance. For me if nothing is doing rather than switch sea baits I move over to indigenous freshwater baits. Now I used to use Eel but they are of course protected now so their use is illegal. Perch is my next choice which will be part of the staple diet of the Pike and is a good bet! Again if nothing is happening inject some air into the abdomen of the Perch and employ the method above for pop ups. Very occasionally I will employ flavours. 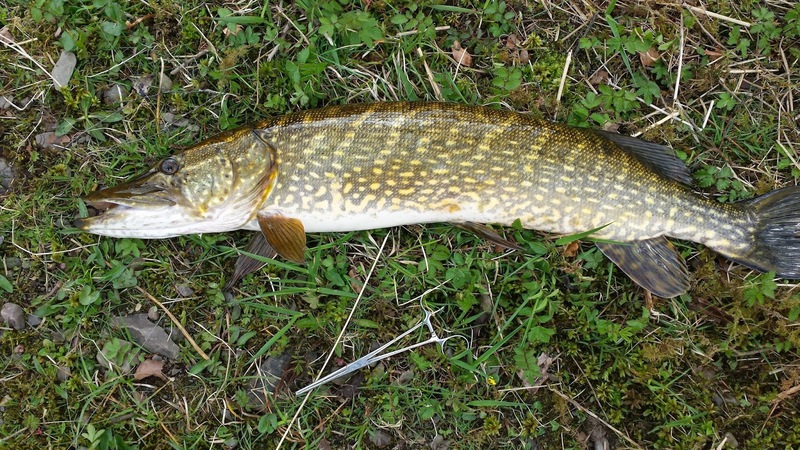 Now many anglers see these as a rip off, but looking at the situation logically Pike use their smell organs in hunting sight coming to the fore only at close range. So it would seem to be beneficial to introduce a factor which widens the natural sphere of your bait. If you can attract Pike in from a wider area and in a loch the size of St Marys that is a good thing then your fishing will be enriched! Having said that myself and two others carried out an informal survey always adding attractants to half of our rods and compared the results. The outcome surprisingly for me was no difference between the flavoured baits and un-doctored baits! The fourteen pounds three ounce fish above was caught on a rather unusual bait developed in Motherwell by ace angler Elliot Fraser. I fished the bait in 12 feet of water ledgering on the bottom. I lost an earlier fish whilst blethering to the local constabulary. It might have been the fourteen but I had not hooked it properly and it let go, and it then attacked it again and it was on but nearing the bank it shook its head and it was off for good! If none of the above work for you try a new spot if you have time, if time is at a premium and you have not caught then that’s one to put down to experience. You may not have caught a fish but you have had a day out in a wonderful place and it’s been said millions of times before “that’s fishing!” The last four weeks have been tough going but this week saw lots of Pike caught, spawning behind them it’s game on! Photo 02 - The Gordon Arms on Saturday! It’s only one day per year to assist the club in maintaining the fixtures and fittings that go along with our tenure. Further it is incumbent on the current administrators to take a proactive view and seek to make things better for those who come later. If the weather permits we will excavate some further trenches filling them with larger stones and drainage tubing. If there are enough body’s we will also carrying out some maintenance on our tree planting sites, specifically re-establishing a vertical stance and removing unwanted vegetation from inside the tubes. If you can please do come along even if only for a couple of hours, we will provide burgers and juice to maintain your stamina levels. 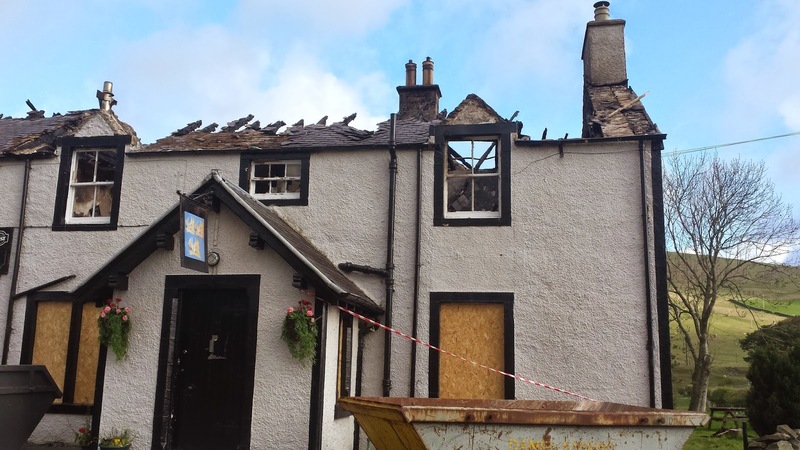 Coming along the road to the loch at the crossroads where the Gordon Arms Hotel stands the sight of the burnt out shell was truly shocking. A fire looks to have completely burnt out the top floor and that after rebuilding recently after a previous fire, some people just have no luck whatsoever! 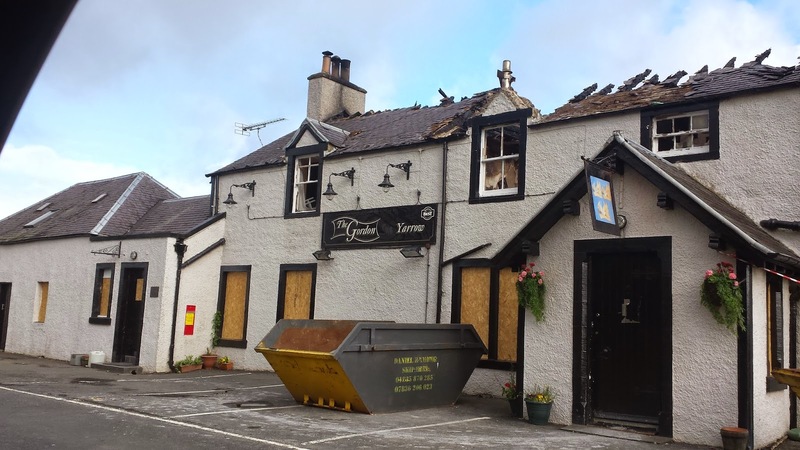 Over their short time in operation they have become a magnet for locals and travellers alike building their reputation on great food, a truly welcoming Scots atmosphere and simple good service! 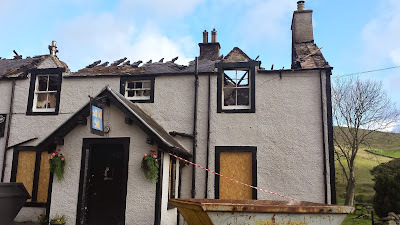 I’ve heard on the grapevine that the proprietors hope to have the bar and kitchens open by July this year which would be fantastic and is typical of the resilient Scots character. The upper floors however will take significantly longer! I know the local community will be helping out and we send our good wishes for a return to normality! Photo 03 - Closed but hopefully not for too long! Now that the dust has settled and we come to terms with another five years of inept bungling from a clueless Tory government, the political situation seems near meltdown. This is a post election scenario unlike any that the country has underwent before with several parties notably the Greens and UKIP polling millions of votes for minimal returns in the number of seats gained. UKIP were one such party polling millions in return for one seat with many second place candidates. One has to ask if this is a fair way to conduct an election. The SNP who performed brilliantly under the first past the post system are also in favour of proportional representation. The Tories with a majority government in power with only 34% of the vote, clearly something is far wrong with the current system! UKIP is in self destruct mode with Farage resigning and being reappointed in a time that must be British record and severe infighting. Their inability to fathom the reason they failed caused massive overheating which will ultimately lead to terminal seizure! Similarly the puppets now completely vanquished bar a few littered here and there are counting the cost of their treachery against the electorate. It appears Pupprt Clegg still does not understand the error of his ways, the rank and file puppets however understand only too well! Some good decent puppets sent into the wilderness by a power hungry leader. It would not have been so bad had they completed a successful term of office, as it turned out however it was an unmitigated disaster! Hopefully Puppet Farron will be elected as their new leader and they can return to a more honourable way of carrying out business! Perhaps facing their greatest crisis in their history is the one facing the Labour party in particular Scottish Labour! It’s as if over the last few years the average Labour voter in Scotland morphed into an SNP voter in a seamless transition! This cannot be undone particularly since they are now talking nationally about moving their political stance to the right! You could not make it up, a party of the working classes seeking to emulate the Tories! This would make the Labour party Tory Lite as Nicola Sturgeon coined them and as such not worthy of a vote! The Labour party has gone never to be seen again! Milliband and Balls constructed a party of buffoons with confused and directionless policies much of which was made up as they went along. From day one after Milliband was elected their fate was sealed! The electorate saw through their woolly ideas and rightly rejected them! A new leader won’t make a blind bit of difference, this should have been done 4 years ago! Looking at it in the cold light of day we had a coalition of bunglers whose only success was to have the word "omnishambles" added to the English dictionary! Effectively stifling the recovery from the banking crash they somehow managed to squander billions to no discernible end! To their credit however the Con-Dems in spite of the foregoing still managed to punish the weak, poor and disabled! A party made up of screaming Lord Sutch’s should have been able to oust them yet clueless Labour could not do the job! In Scotland the SNP have occupied the left which was Labour’s natural position and they have made a good job of being the party of the people! It’s difficult to see where a revitalised Labour party would sit other than to the right of the SNP, then it would not be the Labour party so beloved of the working classes for so long! Labour in Scotland has now been consigned to the history books never again to be a force in Scottish politics! The Tories continue to bungle onwards and looks likely to be the government that presides over the end of the United Kingdom! Nicola Sturgeon has set out her stall clearly for Lord Snooty in that proposals way in excess of those proposed by the Smith commission will be required by the people of Scotland! The future looks ever more torrid for the numpty’s as the Tory right tools up in readiness for the battle over Europe. There will also be calls for increased Welsh devolution coupled with Northern Ireland seeking a more autonomous role and of course bungling Bill Hague’s call for English devolution! It looks and is a mess from Lord Snooty’s perspective! I suspect the joy of an unexpected victory in the election has already worn off, the greatest crisis in the UKs history beckons! England must be prepared to suffer at least the next ten years under Tory misrule! The only outcome is political meltdown, bring it on! Lord Snooty just a week into his term rushed up to Scotland to acknowledge the mandate the people of Scotland gave to the SNP! Fearful of an early referendum he obviously wants to be seen to be reasonable! Nicola Sturgeon true to her word gave Snooty a list of demands and will now formalise that list and wait for the Westminster response. With the implosion of Labour and wipe out of the puppets Lord Snooty is clearly the premier of England, in Scotland however we have rejected his vile policies making his premiership over Scotland illegitimate! Scotland has emphatically rejected the politics of greed spawned by Butcher Thatcher in favour of equality and social cohesion! Lord Snooty will have to tread very carefully as the Scots now watch his every move! Round one to Nicola Sturgeon, ga'an yersel hen! The refugees arriving in Italy continue to grow. they have taken and are looking after over 70,000 of these desperate people! Germany also doing its bit has taken thousands and other European nations also taking significant numbers. The UK? Well it appears their total is close to 150! Desperate hunger ridden weak and oppressed people worthy of anyone's help and the above is Lord Snooty's response! Tories - the very pits of our society, a thoroughly detestable bunch of rich people with no concern for other unfortunate people!